When I tried to do this, the configuration wizard error'd out with a generic error of, "Could not connect to Microsoft Dynamics CRM Server, please contact your Administrator." Even if I tried via the server IP address, I received the same error. Modify the host file on your server to add a mapping between IP address and server host name. 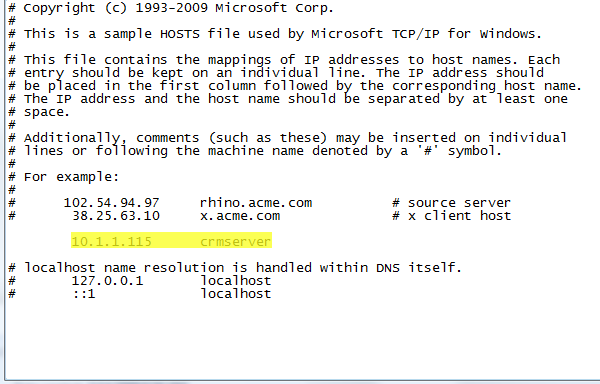 For example: If your IP address is 10.1.1.115 and the host name of the server is "CRMSERVER". Navigate to c:\windows\system32\drivers\etc and open the file hosts in your notepad and add the following line as shown in the image below. In your IE (Internet Explorer), add http://crmserver/ to your Local Intranet zone. Steps: Open IE > Tools > Internet Options > Security Tab > Local Intranet > Click on Sites > Advanced button. Check if CRM is still accessible via the Internet Explorer Browser?